In November of this year the inaugural Northwest Astrology and Tarot Salon will be held at the Breitenbush Conference Center, near Detroit, OR. (More information about the Salon can be found here – nwsalon.com .) I would like to introduce you to Dr. Robert Volkmann, one of the Conversation Leaders for this event. 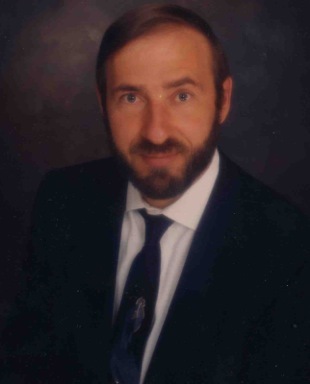 Dr. Volkmann trained as a Medical Doctor in Family Practice. For several years his focus was Obstetrics, here he delivered almost 2,000 babies. Following this he did general Family Practice, with an emphasis on counseling. These were generally single visits, but occasionally this involved several visits, or even long term counseling. Concurrent with Dr. Volkmann’s Medical Practice was his personal practice in Meditation, where he did extensive travelling in the Inner Worlds that was self-healing, educational, and an extensive exploration of the subconscious and some of the higher states of consciousness. Much of his interest in counseling is in helping people become more self-aware, and to give them tools to work with. Dr. Volkmann kept a journal of his dreams and meditations, a journal that started off at about 150 pages a year in 1985, and is closer to 400 pages a year now. I would like to share a blog that Toni wrote about her journey with Dr. Volkmann – http://tonigilbert.com/blog/2014/01/robert-volkmann-and-me/. I look forward to Dr. Volkmann’s input in Breitenbush, and thank him for taking the time to be there for this inaugural event. 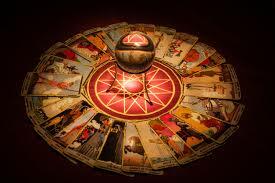 The worlds of both Astrology and Tarot will be opened up to an unimaginable degree. I am already amazed at what is going to happen! Reproduction prohibited without the written permission of the author. In November of this year the inaugural Northwest Astrology and Tarot Salon will be held at the Breitenbush Conference Center, near Detroit, OR. (More information about the Salon can be found here – nwsalon.com. ) Founder and Hostess for this event is Toni Gilbert. I have known Toni as an Internet friend for several years. She is an artist, author, editor, transpersonal counselor with a background in holistic nursing. 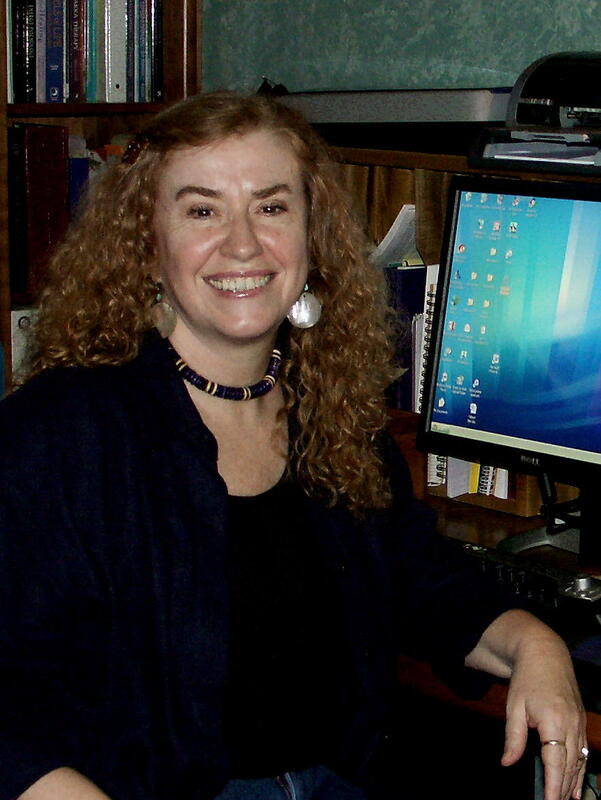 Her written works include many published articles, along with two books – “Messages From The Archetypes”, 2004, White Cloud Press, and “Gaining Archetypal Vision”, 2011, Schiffer Publishing. Toni was founding director of the Oregon Holistic Nurses Association, and editor for the Alternative Journal of Nursing. Toni has owned a “summer cabin” (yes, the cabin in the photo above!) at Breitenbush (but on National Forest land) for the past twelve years. She discovered Breitenbush in the 70’s”, but became involved with the people and projects there in 1998. 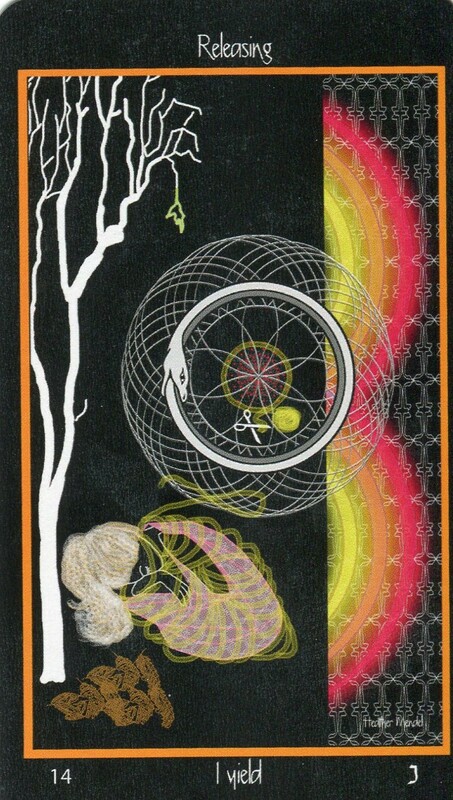 In “The Healing Art of Tarot”, Toni writes about the work she did at one of Breitenbush’s annual retreats (http://www.tonigilbert.com/articles/Healing-Art-of-Tarot.pdf). Some of the Salon Conversations will be taking place in Toni’s cabin! The subject that Toni will be leading conversations on will be “Gaining Archetypal Vision”. Toni has seen patterns in our world since her twenties beginning with the poetry-music of Bob Dylan, she wondered why he spoke to her so profoundly. Later in her studies, she discovered that Carl Jung also shared this way of perceiving. With many years of esoteric studies Toni began to explore Tarot cards at age 50. She immediately realized that the cards mirrored her own thoughts, knowing that they were drawing on her own unconscious mind’s contents. With the help of a cosmic synchronicity, she sees the cards as a nighttime dream laid out to be interpreted. She did five years of intense intellectual and experimental study before using them in her alternative nursing practice. She could see that they were the perfect healing art to use with wellness counseling and that nursing would benefit. It was such a good tool that she felt the need to write her first book (“Messages from the Archetypes”), and began to use them in a holistic nursing venue that she termed an alternative nursing practice. Toni has retired her nursing license, but continues to offer her wisdom as a transpersonal counselor using the tools mentioned on her personal web site (www.tonigilbert.com), including guided imagery, energy work, meditation, Tarot Counseling, dream interpretation, essential oils, expressive arts, and mind/body consciousness. I am so looking forward to in depth conversations on the archetypes, with the unending little turns in the road that this can take us to. 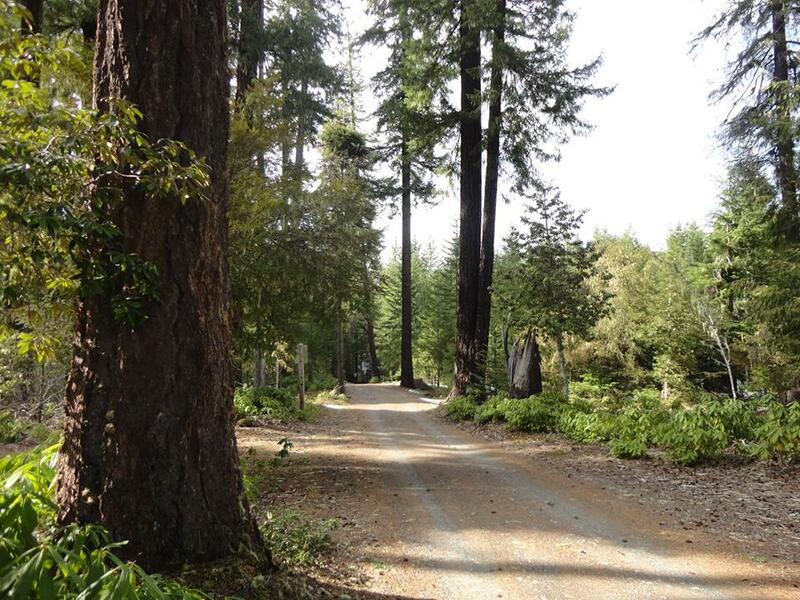 Breitenbush is a lovely area, deep in the forest that lends … itself to introspection, and a grounded connection with life. As Hostess, Toni is gifting the Tarot world with an incredible “time warp” of past/present/future. I fully expect to be leaving Breitenbush with a fresh perspective not only of astrology and Tarot, and how they can work together, but of the personal work that I am doing. “The Syzygy Oracle” is a thirty-two card deck based on the twenty-two cards of the Major Arcana of the Tarot, and the ten sefirot of the Tree of Life. It carries a strong connection between the Tarot and the Kabbalah (the Hebrew letters and the pathways on the Tree of Life), and the Sacred Feminine. I am impressed with the honoring of the Sacred Feminine in this book. It is offered as a spiritual practice, rather than simply a concept. When we involve something as a spiritual practice, we take it deeply into our life. It “becomes us”. In the case of the Sacred Feminine, we are opening ourselves to intuitive wisdom. Here, the patriarchal lineage of the cards has been lifted and reinterpreted from a feminine perspective. Through aligning with the twenty-two letters of the Hebrew alphabet, we access three levels of soul consciousness: known in Hebrew as nefesh, ruach, and neshamah. The reader/Seeker works through meditations and mantras. The ten sefirot cards represent energy centers, presenting the Tree of Life as an experiential introduction to Kabbalah. The cards and the two hundred and thirty-three page companion book are purchased separately, although I am reviewing them together. In her introduction, Mendel notes that the spiritual journey depicted in the “Syzygy Oracle” offers a pathway and practice for the contemporary seeker who is willing to acknowledge and honor the darkness as the primal and necessary backdrop to light and life. Once we are awakened, we honor the knowledge that life is deeper, richer, and stronger than it appears on the surface. In using the oracle, Mendel encourages the reader to a personal practice of gaining insight and wisdom from the cards. If the reader/seeker does not own the deck, there is the ability to visit her website (www,heathermendel.com, or www.sacredfemininekabbalah.com), fill out the form, and download a black and white set of illustrations that can be pasted onto index cards. Another method would be to take blank index cards and number them one through thirty-two. The card backs can be left blank, or decorated in a manner pleasing to the reader/seeker. For the creative reader/seeker, number a deck of plain playing cards, then decorate each card with a collage or series of words that apply to the teaching. The card backs can be left plain, or decorated. If the reader/seeker is reading from their own deck, it is suggested that they compare the card with the illustration in the book. Read the chapter, and see what themes develop. In this deck, nefesh is accessed through the assigned letter of the Hebrew alphabet, ruach through its number, and neshama through its stories. Each card offers a theme, and a mantra for meditation. Charts are given for associations with: Card/Theme/Rider-Waite/Hebrew letter, Card/Hebrew Letter/Pathway on the Tree of Life, Card/Archetype/Mentor and Symbol. The structure of a reading is through letter, number, and story. Nefesh relates to the physical realm, ruach to the perception of pattern that is intrinsic and instinctual, and neshama to the emotional realm. Each Tarot card is presented with a full-page black and white scan, a Theme, Mantra, Archetype, Mentor, Essential Oil, and the traditional Tarot card that it is associated with. 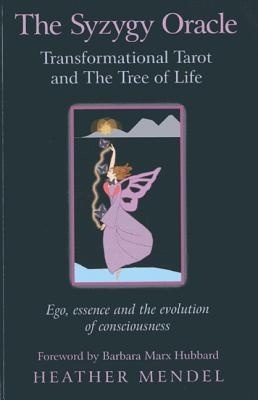 The card and how it operates is discussed, along with the function of the Archetypal Mentor, the associated pathway on the Tree of Life, a short summary, questions for the reader/seeker to ask themselves, and a meditation. Each of the ten sefirot are presented with a full-page black and white scan, the name of the pathway, the keyword, what the pillar represents, a discussion of the energy, and a short paragraph on how the reader/seeker can put this energy to use in their life. The image for each of the sefirot is a mandala created from photographs of flowers from Mendel’s own garden, and from her travels. Running along the outside of the mandala are keywords for that specific sefirot. The cards themselves are 2 ¾” by 4 ¾”, of quality card stock. 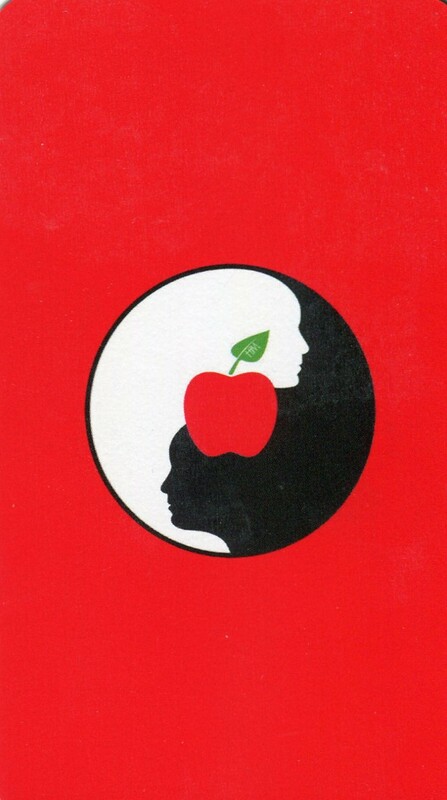 The backs are bright red, with a center mandala comprised of quite an interesting black and white shadow profiles, with a bright red apple, with a green leaf, sitting between them. The backs are not reversible, as the cards are not meant to be read with reversals. The card faces show a black background, with the images built up over that. The twenty-two Tarot cards show the card name at the top of the card, the card number in the lower left hand corner, the theme in the middle, and the Hebrew Letter in the lower right hand corner. The ten sefirot cards show the keyword for the card at the top, and the sefirot number across the bottom. I love the imagery that is used in these cards. Inverting (The Hanging Man) shows a figure in the traditional head down position. In this card, the figure is located between two trees. The hands are held behind the back, the right leg crossed at the knee behind the left leg. The sun shines fully in the upper right hand corner of the card. Constricting (The Devil) shows a female figure, blindfolded, standing at the crossroads, in front of a mirrored pillar. 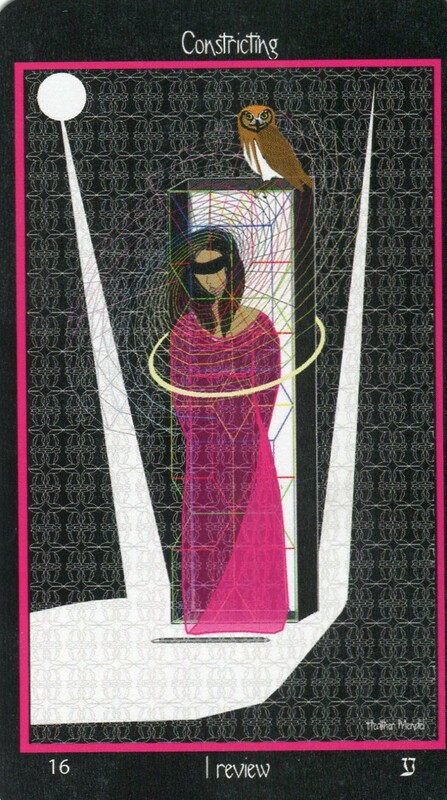 The sacred geometric torus spins around her representing her own fears that blind and paralyse her. White light shines down on her from both sides of the card. An owl sits on top of the pillar, and the recurring grid is composed of the Hebrew letter “ayin” (the 16th letter of the Hebrew alphabet) is superimposed over all of the images.. Becoming (The World) shows a female figure, dancing on a spiral of stairs. The night sky is behind her, with the sun and the moon being one. She holds an ankh in her right hand. A white pyramid stand beneath her, with a mandala painted on it. From her heart center a spiral of joy radiates outward. 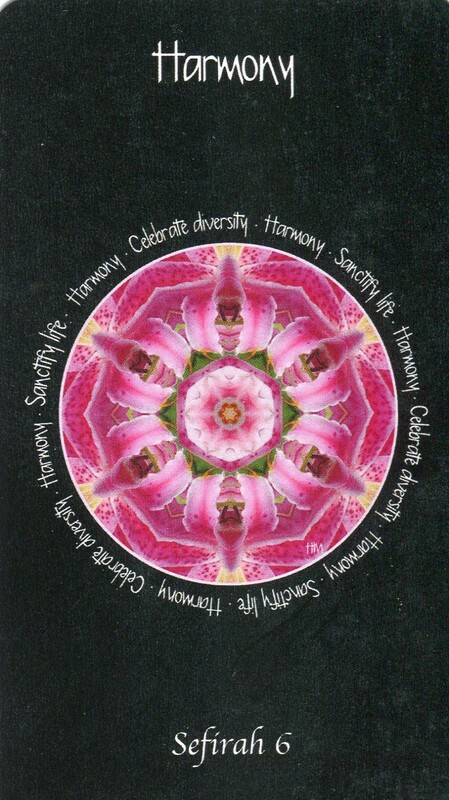 The mandala for the sefirot Harmony is made up of lovely pink flowers. The keywords surrounding it include Harmony Celebrate Diversity, and Sanctify Life, in a continuing pattern. 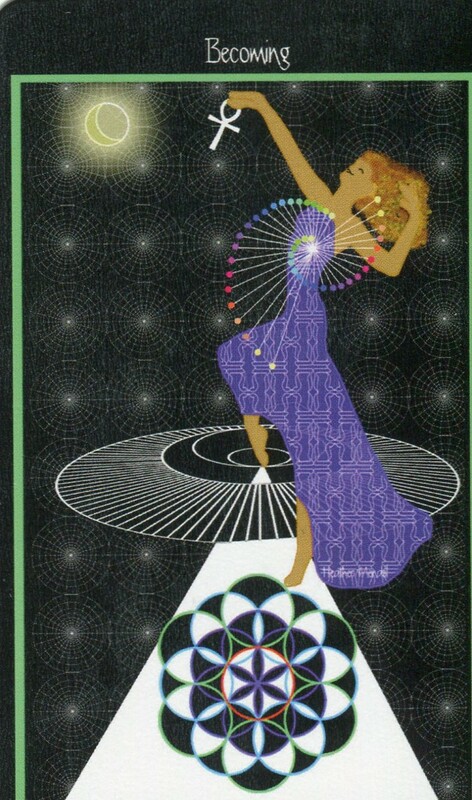 This deck is meant to be used for spiritual study, for personal empowerment, and for understanding the Sacred Feminine. It can be used for divination, but that is not the intent. I found the book to be well written, and the cards to have great depth through their combination of imagery. Two thumbs up! The intent, according to Toni, is to gather people together to “partly amuse each other, and partly increase the knowledge of the participants through conversation”. I am quite looking forward to this whole party! here will be conversation on Astrology and Tarot, study and practice with the Tarot cards and with astrological charts. All levels of students are encouraged to attend … from beginner to master! 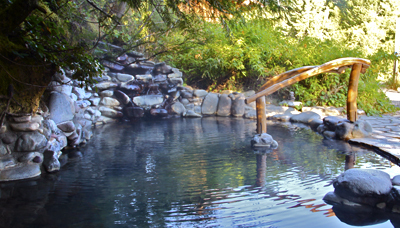 The salon is being held at Breitenbush Hot Springs Retreat & Conference Center, outside of Portland, OR. 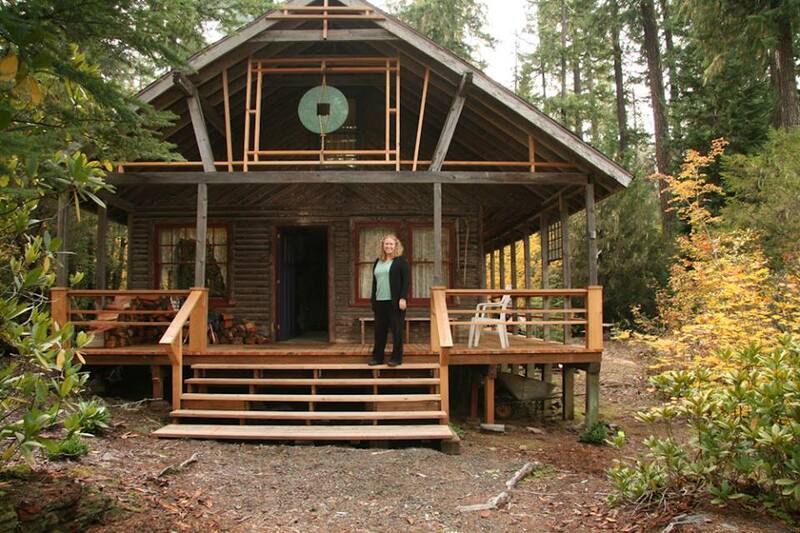 Groups will meet in Toni’s cabin, as well as at one of the beautiful spaces at Breitenbush. Conversation Leaders include Toni Gilbert, James Wanless, Isha Lerner, CHristine Payne-Towler, Robert Volkman, Paul Nagy, and Arwen Lynch. To find out more information, go to Toni’s site, and click on Workshops. If you would like to attend, print out the application, fill it in, and send it to Toni (the address is on the form). This is an “insurance form”, in that it will reserve a place for you when open registration starts in June. No payment is required until June. Each participant will also need to make room and board reservations through Breitenbush.com six months in advance. We hope that you will all join us on the lovely adventure! Requires iOS7.0 or later. Compatible with iPhone, iPad, and iPod touch. This app is optimized for iPhone5. The Phuture Tarot App is part of the services offered through the http://phuture.me/ website. It is free to download on iTunes, and is available for iPhone, iPad, and iPod. It is defined as a Tarot eco-system of Tarot decks, Tarot Spreads, Tarot Card look-up references, Tarot Readers, & Tarot Artists. It is a Tarot, Numerology, and Astrology all in one app. Two digital decks are included free with this app: the Soprafino Tarot, the Golden Age of Hollywood Tarot, and the Aquatic Tarot. Available for purchase are digital versions of The Short Hand Tarot, the BlueDogRose Tarot, the Tarot of the Apocalypse. Packs of credits in the amounts of 1488, 1799, 2099, 2999, and 3599 are available for purchase. The following review is based on the app usage with an iPhone. Two things that I find disconcerting about this app – the spelling of “Phuture” (it is one of those things that gets on my last nerve …but has nothing to do with what the app offers! ), and the iPhone icon for the app, which is the outline of a head, with the word “Tarot” under it. All of my other Tarot apps let me know what they are, by name. Again, this has nothing to do with the performance of the app, but it also gets on my last nerve! The landing page for the app gives four choices: Numerology, Tarot, Account, and Forecasting. In the bottom left hand corner is a link to a page that asks if you like the app, or if you have found a problem with it. I found this to be both useful and thoughtful on the part of the designers. The bottom right hand corner of the landing page takes the user to Settings, where they can put a Passcode Lock on, get notification of a daily forecast (and set the time for the forecast), set the choice for card selection and deck animation, set the date for the Essence influence in numerology, check out the White Magic and Wedding Date Numerology apps, go to the apps comments page, check out Tips, Tricks, & FAQ, access the acknowledgements page, and read the terms and conditions of use. The designer of this app is Mr. George M. Taylor. In his acknowledgements, he includes the individuals that created specific Tarot spreads, gives Tarot card reference bookmarks, and very importantly give a nod to individuals and sites that have been helpful with software advice. Last, but not least, there are links provided to the Phuture Facebook Fan Page, and their Twitter page. Under the Numerology link the user is asked for their full name, and date of birth. From there, they can click on Life’s Cycles & Destiny, Name Analysis, and Essence. Under Life’s Path & Cycles, were the 11 and 22 cycle, Life’s Pinnacles, and a listing of three Life’s Challenges. There was a short, interesting, and accurate (I have lived long enough to have been through a lot of cycles!) write-up on each. Quite a good place to get some basic in on how numerology plays out in your life. Under Name Analysis, we see Expression, Inner Dreams, Soul’s Urge, and Subconscious Self, as well as 2 Karmic Lessons. Again, short but accurate write-ups. For whatever reason, I could not get Essence to work. Tapping on the icon in the upper left hand side of the screen takes you back to the landing screen. Tapping on the icon on the upper right hand side of the screen takes you to the commentary page on the app, where you can “like” it, or share any issues that you may be having. Clicking on the Tarot app takes you to a page where you can see all spreads, see your favorite spreads, and see your saved spreads. The categories for the spreads are General (which includes the Celtic Cross, Astrology 12 House, and Alchemist’s spreads), Forecasting (which includes Past/Present/Future, Week Ahead, Month Ahead, and Year Ahead), Love and Relationships (which includes Future Romance, Me and my Ex, and The Other Woman), Career (which includes Career SWOT analysis), Health (which includes Health problem, and Weight Loss), Spirituality (which includes the Tree of Life, and the Chakra’s), and the ability to create your own spread, using the following parameters: 1 card, 2 card, 3 card, 4 cards (1 X 4), 5 cards (1 X 5), 6 cards (2 X 3), 7 cards (H), 8 cards (2 X 4), and 9 cards (3 X 3). The upper left hand corner shows a link that will take the user back to the Tarot page, while the upper right hand corner shows a link that will take the user to a page where they can create their own Tarot spreads. 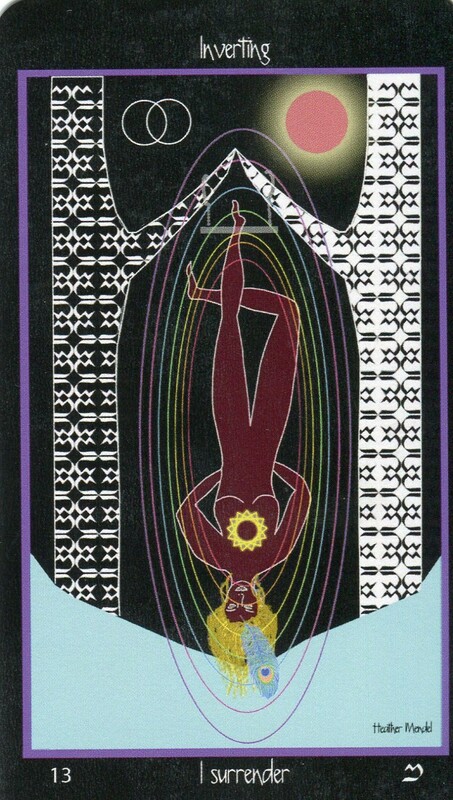 Under decks, the options are Intuitive Select, Rider Waite Tarot (1909), or browse decks. There is the ability on the next page to add decks from the Phuture Tarot store. Clicking on a deck will take the user to a screen with links to each of the suits. From this page, individual cards can be clicked on. Each individual card shows a color scan, links to Wikipedia, Aeclectic Tarot, and Biddy Tarot, a description of the card and its energy, and an excerpt from “The Pictorial Key To The Tarot” (Arthur Edward Waite, 1911). Under Card Backs, the user can choose the default setting, or the Enlighten setting. Under Readings, the user can choose Tarot Readers, or My Readings. My Readings leads to a page where the user is shown what to expect from a digital reading from one of Phuture Me’s Tarot readers. Under Tarot Readers, a list of available readers comes up, with a listing of their status (available or not available), their experience, attributes, specialties, languages, how long they have been a member, and the time frame they can be expected to respond within. There is a link to their Introduction (which is basically their bio), a link to the Tarot spreads that they read, the Tarot decks that they read, and client testimonials. Under Account, the user can create an account, check their password, check for Tarot Readers, and access the Tarot Readings disclaimer. Under Forecasting, the user will see the current date, the sign that the Sun is in, and the degrees for that sign, the waxing/waning status, and the sign the Moon is in, with the degrees for that sign. Information is provided for the user’s Personal Day, Personal Month, and Personal year. I found all of this information both interesting and accurate. There are also links to Tarot Event Timing, and a specific Tarot Timing spread. Under the link for Today’s Tarot Card, the user has the option of choosing a card for that day only, or for the week ahead. Under Tarot Trends, the user will see Lunar Month Trends and All Time Trends. This is a bit of a complicated app, but if you follow the links, and pay attention, you will get the responses that you are looking for. I did not choose to create an account, so I cannot speak to the ability of the readers. Nor do I feel that a reading from one reader should reflect on the entire app. The app is free for download, and there are many usable sections to it, without having to create an account. <Regrouping>Ahem. “This” Area 52 is a daily resource, combining Tarot and astrology to help guide the Seeker through their day. My personal suggestion would be to keep a journal for the coming year, noting the wisdom in this book as it plays out in your life. And remember … we all have choices, we are the architect of our own life! (Yes, that was a nod to the architect in Jordan, and how he translates that into real life.) Our daily choices are the small steps that we take on manifesting our life purpose, and staying on our path. In his Introduction, Jordan suggests that the Seeker pull out the cards for their day from their favorite deck as they read their daily TarotScopes … it gives a visual on the day ahead, to go with the written information. My own suggestion here is that you may also want to use a deck that you are just becoming familiar with, or a deck that you are perhaps “at odds” with. Or do it in comparative style, and use more than one deck. Jordan is sneaky … he also suggests that the Seeker may want to draw extra cards to expand those presented in the book each day. “Monthly Court Card Couplings” are also discussed in the introduction. It is suggested that the Seeker combine them with the “Annual Earth Card”. Jordan gives the Seeker questions to ask about the “Monthly Court Cards”, and the theme that they present for the month. The Seeker is not just reading this material, nodding, and setting it aside. They are encouraged to put it to work in their life. The “Annual Earth Card” remains the same, while the “Monthly Court Cards” differ from month to month. (Note: Add the numbers of any given year together to determine the “Annual Earth Card”. For 2014, the “Annual Earth Card” is seven (2+1+4=7), which in the Tarot is the Chariot.) The Chariot will inform the Seeker throughout the year 2014, in combination with the astrological sign that the Moon is in. You have to love digital books … Jordan has provided a link to the moon sign schedule for each month! Jordan has provided a detailed graphic that shows how the “Annual Earth Card” and the “Monthly Court Cards” work together. For each month, there is a link to the Moon sign schedule, the New Moon and Full Moon are indicated by day and time, there is a weekly theme, a weekly word wisdom, a pair of Tarot cards for each day, along with a few words of wisdom about each day. There are three bonuses included at the end of this e-book: “The Chariot & Birth-Placing Identity With The Sevens” (this is a Birth Card article, with links at the end to the eight other Birth Card articles that Jordan has written), “Be Fluid Don’t Go With The Flow – Resistance Is Futile”, and “Tarot Warm-Up Technique: Interview With the Spampires”. “Area 52” can be purchased here. “Area 52” is a mind-expanding, fabulous tool for creating your year as you go. For making the best of the energy that is in your life, for understanding your life, and for living your BIG DREAM! Tarot 2014 … changes, growth, and new paths within the Tarot world. I will be doing a once a month blog that wanders around and hits the highlights pertinent to whatever is crossing my path. Both Tarot and other divination systems will find their way here … I hope that you will find something that interests you, and perhaps pushes a few boundaries! I have watched the growth of a good friend of mine for several years now … and she has achieved some amazing things! Her name is Mary Nale, and she is the founder and editor of Attune Magazine, and Attune Radio. She also writes a blog, and features articles on the Attune Magazine site – AttuneMagazine.com. She is the creator of three divination decks – Messages, A Deck For Channeling; the Purple Lenormand; and the Runes Deck. Mary hosts a Saturday morning show on BTR (http://www.blogtalkradio.com/attunemagazineradio), a monthly show entitled Sessions (co-hosted with Brad Tesh and myself), and facilitates shows for Jean Maurie Puhlman and Maggie Lukowski (Personal Empowerment), and ReeNee Cummins (U Predict). Check out the Attune Magazine site,and see where you might want to contribute! Mary’s Facebook page is here. A gentleman that I met through Mary Nale is certainly holding his own as far as talk shows goes! His name is Tidal Miller, and he hosts the “Alchemical Artisans Hour” on PEN (Paranormal Encounter Network). You can also find him on Facebook. Tidal has a great sense of humor, and seems to know all of the right questions to ask! It was a pleasure to be interviewed by him! This is a gentleman to keep your eye on! That breeze that just swept by you was Theresa Reed! Theresa, aka “The Tarot Lady”, is a professional Tarot reader, teacher, and mentor (especially for growing Tarot businesses). Her mission is to empower people ,,, and she is quite successful at doing so! She also writes a blog that appears on her site … and pulls no punches! Theresa’s Facebook page is here. Which takes us to another Theresa … Theresa Pridemore. Theresa is the brains behind the Portland Tarot … a 23 card Tarot deck that is in the process of morphing into a 78 card deck! The Portland Tarot can be seen here. Theresa’s Facebook page can be seen here. One of my favorite people is James Wanless, PhD. The Greening Man’s work can be seen here, and here. His Facebook page can be seen here. Tarot apps are becoming my favorite things! Two of the top companies that I know about are The Fool’s Dog (Jason & Caroline Kenner), and Tarot eCards (Ron Leong). 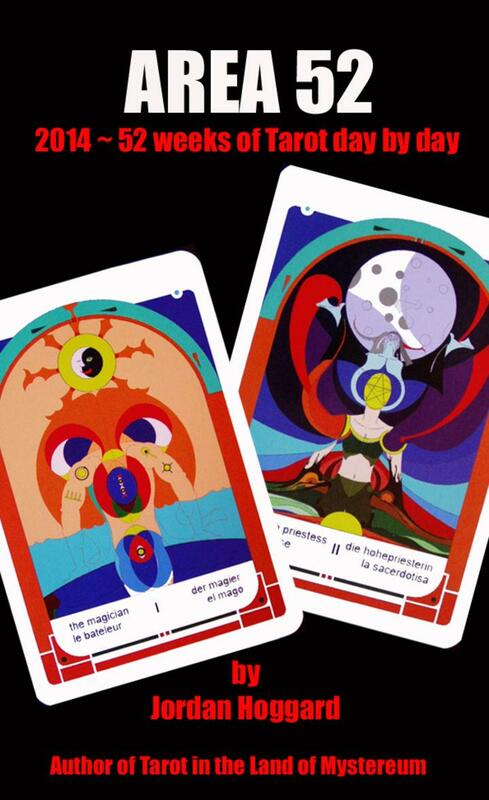 Two new decks to check out are the Syzygy Oracle (Heather Mendel), and the Tarot of the Apocalypse (Magdalena Walulik and Swiatoslaw Nowicki). For a comprehensive study of Tarot (especially the Continental style Tarot), take a look at Christine Payne-Towler’s Tarot University Arkletters. Christine and her partner, Michael Dowers, are the creators of a unique Continental-style deck entitled Tarot oft he Holy Light. Last, but not least, an adventure! Tarotist and transpersonal counselor Toni Gilbert is holding the first ever Northwest Astrology and Tarot Salon this November in Breitenbush Hot Springs, OR. This four day workshop will include presenters James Wanless Stephanie Arwen Lynch, Paul Nagy, Isha Lerner, Christine PayneTowler, and Robert Volkmann. I will be there too … hope to see you there!